H-Elite feature and a thmbs up from the pride team. 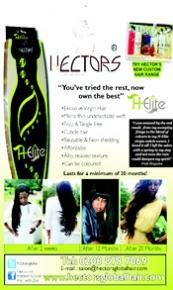 Also a teaser of the new Hector's product range. " I was amazed at the end result .From my sweeping fringe to the blend of colours of my H-Elite virgin cuticle weave.i loved it all. I left the salon with a spring in my step and not even the rain could dampen my spirits!"